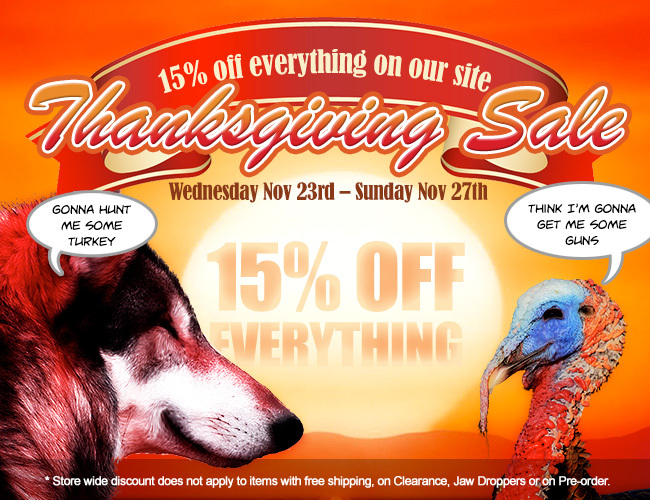 You are here: REDWOLF > Home > News >News Detail - Thanksgiving Sale - 15% OFF EVERYTHING ON OUR SITE! Thanksgiving Sale: 15% OFF EVERYTHING ON OUR SITE!! *Discount does not apply to items with free shipping, on Clearance, or on Pre-order. 15% Discount is applied AUTOMATICALLY during checkout and is shown just before payment confirmation. AND all orders placed up until November 30th get MYSTERY COUPON CODE of UP TO 25% OFF as well for future purchases!